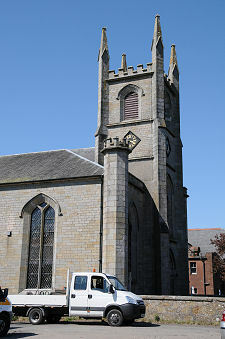 The village of New Cumnock stands astride the A76 main road some 35 miles north of Dumfries, 20 miles south east of Kilmarnock, and five miles from Cumnock. The main road crosses the Afton Water here, then takes a sharp kink to the north through the centre of the village, beyond which it crosses the River Nith. The Afton Water flows into the River Nith just to the north of the village. 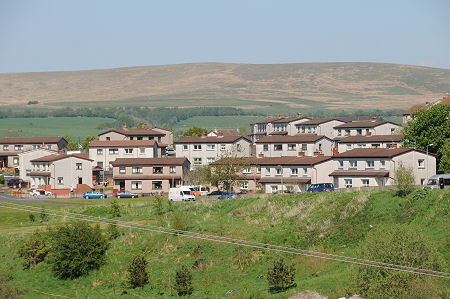 This part of Upper Nithsdale has a very upland feel, and New Cumnock stands at a height that varies from 600ft at the bridge over the River Nith to over 750ft at its southern end. It is also a surprisingly remote place in which to find a settlement that today has a population of some 3,700, and which at its peak in the 1950s exceeded 5,000. The reason for the existence of New Cumnock is no longer as obvious as it would have been 60 years ago. The story of New Cumnock revolves almost entirely around the coal that was mined in and around the village over the centuries. In 1950 there were five pits operating here, with a combined workforce of over 1,500 miners. They closed at various points in the 1950s and 1960s, with the final two, Knockshinnock Castle Colliery and Bank Colliery closing in 1968 and 1969 respectively. Coal extraction does still take place in the surrounding countryside, but today's open cast mining employs far fewer people than the deep mines once did. 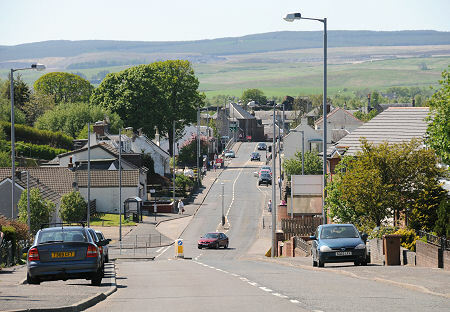 The closure of the collieries largely removed the economic rationale for New Cumnock, and although the mines disappeared more than a generation ago, the village's location and facilities have not equipped it well to recover. This is reflected in the fall of population since the mines were at their peak, and in the boarded-up commercial properties and houses that are all too obvious to anyone visiting the village. On the other hand, there are some very attractive buildings in the village, and the wider setting remains superb. The cul de sac Afton Glen to the south is particularly attractive and unspoiled. 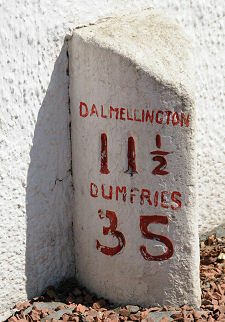 The history of New Cumnock is remembered in an open area beside the River Afton, behind the village school. Here, in what almost amounts to an outdoor museum, are items gleaned from the mining past, such as a winding wheel and a railway wagon; alongside farming implements representing the agricultural heritage of the area. 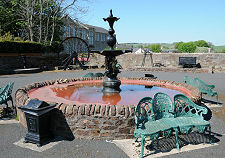 Meanwhile, a grassy open area to the west of "Castle", the name of New Cumnock's main street, is home to a memorial to the New Cumnock mineworkers who lost their lives in the course of duty over the centuries. The worst accident in the village's mines took place on 7 September 1950 when an underground collapse trapped 129 miners. Detailed plans of a recently closed nearby pit still existed, and these showed that its workings came within 20ft of the area cut off by the collapse. By digging through from the abandoned pit it was possible to rescue 116 of the trapped miners, though the other 13 died in the accident. The origins of New Cumnock date back to a settlement built near the confluence of the Afton Water and the River Nith, with at its focus the fascinatingly named Black Bog Castle (or Cumnock Castle) built here in the 1200s by the Earls of Dunbar and March. The castle stood in ruins by the end of the 1500s and these were removed in the late 1700s to make way for a church. By the mid 1700s lead mining was under way in the surrounding hills, and within a century this had been followed by lime works, an antimony mine and by coal and iron ore mines. 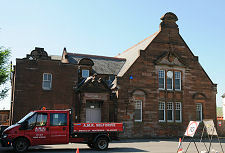 One result was the opening in 1845 of the short lived Nithsdale Iron Company. More coal mines followed, and these were soon served by main line and mineral railways. In the early 1900s the village's coal mines were owned by the New Cumnock Collieries Company, which was nationalised on the creation in 1947 of the National Coal Board.